Akki roti / Rice roti is a unique breakfast of Karnataka. It is called as Tandlachi Bhakri in Maharashtra. It is popular in Kerala and called as Pathiri or Ari pathiri. The white rice roti with beautiful brown spots in it goes well with any spicy accompaniment like enne badanekai (ennai kathirikkai) and spicy tomato chutney. This is a soft and beautifully layered version of akki roti , which is easy to make. I will post another version of akki roti after sometime. The pictures are self explanatory. For detailed recipe scroll down. Heat water in a pan, add salt and oil. When it comes to a rolling boil, simmer the stove, add the rice flour, mix slightly with a fork, switch off the stove, cover and keep aside for 10-15 minutes. When warm enough to handle, coat the hands with oil and knead to a soft, non-sticky dough. Divide the dough into equal-sized balls. 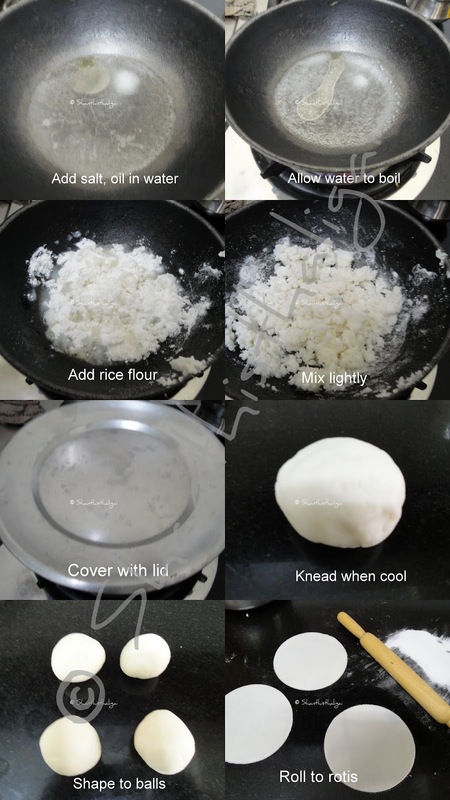 Dust the balls with rice flour. Roll the balls to thin rotis with a rolling pin. If the dough is perfect, you will be able to roll without split edges. However, do not worry about the split edges, you can cut with a lid. 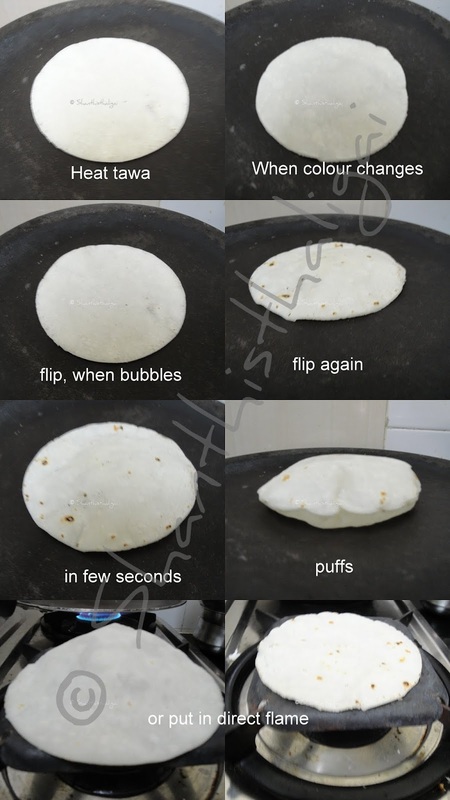 Heat a tawa, place the roti, when the colour changes slightly, flip it to the other side. When you see small bubbles, flip again and slightly press with the spatula or cloth. It will puff up beautifully. Alternatively, when you see small bubbles, take out using the tongs and put the first side down on direct medium flame. Super soft akki roti is ready. 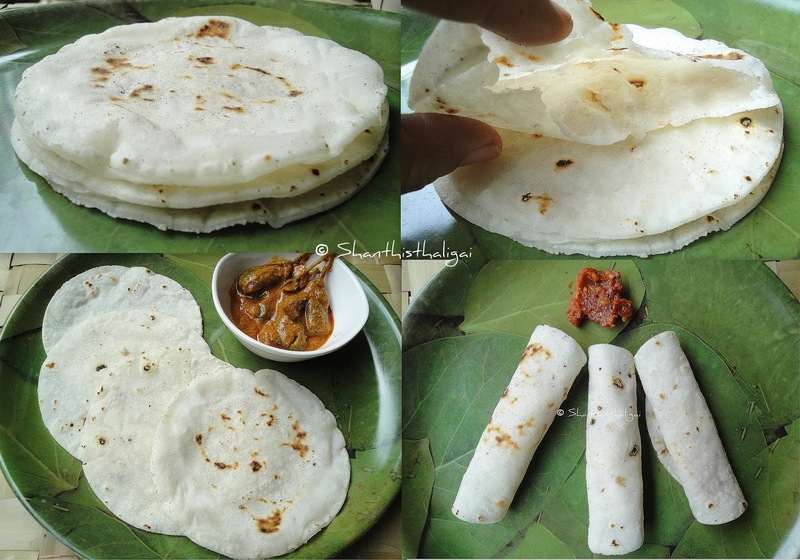 Serve hot with spicy enne badanekai ( ennai kathirikai) or spread spicy tomato thokku on the roti, roll and serve. NOTE: No need to drizzle oil on sides. This is soft even when cool, but at its best when served hot. What a co-incidence.. I have also made it today. Im not able to knead it like rotis. whats the trick here? No tricks preeti, the correct measurement of water, little bit of oil in hands and oil in water is enough. Just read the simple steps given and follow it.You will get it perfect. Tried out perfect layered rotties yummy!! !